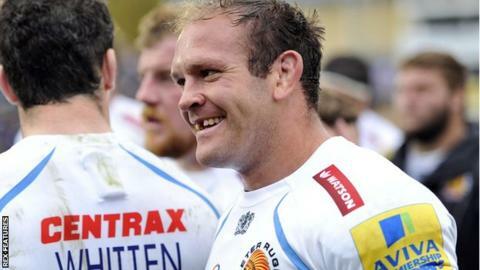 Exeter head coach Rob Baxter praised the contribution of flanker Julian Salvi after the Australian scored his first try for the club in the 41-3 Premiership win at Newcastle. Salvi joined the Chiefs from Leicester in the summer and made his first start at Kingston Park. "You probably don't really see what his contribution is until you sit down and watch the game in detail," Baxter said. "He was probably in 35 rucks and his tackle count will be sky-high." "Don's playing really well at the moment, he's bang on form," he told BBC Radio Devon. "At the moment in a number of positions we've got some good players on form, selection for Leicester, with two ex-Leicester back-rowers there ready to go, is going to be tough, but that's the scenario you want to be in." "We targeted 12-plus points form this first block of four, so we're kind of on target for that and anything over that we'd be very pleased with, and less than that we won't be," he added. "We're just putting ourselves in a good position, games against the top-end sides can change on one decision or one thing you get wrong, or one mistake you make."